Corduroy is a medium to heavyweight cotton that’s woven with a pronounced nap. It’s smooth on the underside and ribbed on the topside, with a short texture similar to cotton velveteen. It isn’t a crisp fabric, but it can be stiff. Even so, it’s usually soft to the touch. Corduroy does not respond well to delicate embellishing such as gathers or shirring; it’s simply too thick. Pleats will be difficult to press and will add unwanted bulk. Keep the garment design simple, with as few seams as possible, and keep in mind the fabric’s stiffness. (For example, choose a pencil skirt instead of a flared skirt, because a flared skirt will probably stick out too much). Use corduroy for cool weather garments, such as skirts, trousers, jackets, and coats. Lightweight corduroy could be used for a long-sleeved shirt. For visual interest, add piping at the seams or contrasting bias binding out of a thinner fabric. Be aware that the ribbed nap will require piecing at the seams, unless you don’t mind the ribs not matching. You won’t be able to line the ribs up perfectly in most cases, so aim for a pleasing juxtaposition: stripes typically look good when they chevorn at the seams. Piping in the seam will help deflect the eye from any misalignment. If your corduroy is thick, use a larger needle. For bulky seams, try a needle made for use with denim. Because the fabric is thick, you may need to loosen your tension a little or use a longer stitch length. Short pins may bend upon going through all layers, so try longer, thicker pins, or baste your layers instead of pinning them. If your seams are too bulky, try shaving the ribs within the seam allowance. Be sure and reduce bulk wherever possible by trimming seam allowances and clipping corners. As with any stretch fabric, use a stitch designed to move with the fabric. A standard straight stitch will pop and break when the fabric is stretched. If you don’t have a serger or a machine with special stretch stitches, use a narrow zig-zag stitch. Be aware that corduroy sheds! Keep your workspace vacuumed to avoid an accumulation of fuzz, and clean your sewing machine out frequently. This is a stretch corduroy that’s been embroidered with a repeating floral motif. It’s dark chocolate brown with accents of brown, white, rusty orange, and slate blue. It’s 56” wide and can be machine washed, tumble dry low. I loved the color combination, so I bought 2.5 yards at $4.98/yd at Fabric.com. 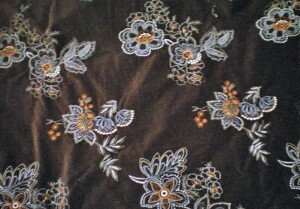 I’ve been working on a simple gored skirt using this fabric. 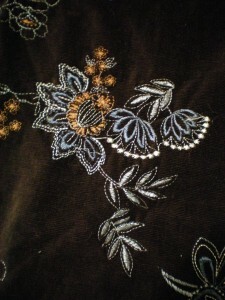 The design suits the fabric very well and I think the finished design will be perfectly suited to an autumn outfit. The corduroy ensures that it’s warm, the colors are perfect for autumn or winter, and the embroidery adds a touch of prettiness to an otherwise rugged fabric. It is, however, a pain to match the embroidery pattern! Have you sewn with stretch corduroy lately? What tips do you have for working with it?